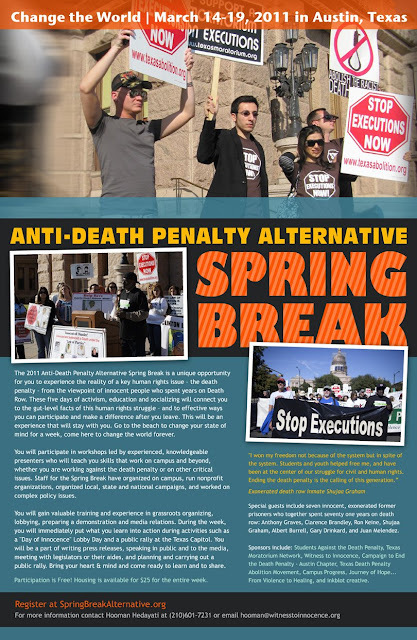 The “Anti-Death Penalty Alternative Spring Break” will be held in Austin from March 14-18, 2011. The full schedule and a registration form is on the website:www.springbreakalternative.org/deathpenalty. Special guests include six exonerated people who all-together spent about 50 years condemned to death for crimes they did not commit: Anthony Graves, Clarence Brandley,Shujaa Graham, Ron Keine, Gary Drinkard and Albert Burrell. Now is an important time in the national effort to end the death penalty. After 11 years of a moratorium, Illinois may soon abolish the death penalty if the governor signs the abolition bill he has been sent by Illinois legislators. Students who attend the alternative spring break will train to join the national effort against the death penalty and to help stop executions in Texas – the number one execution state in the United States. former Texas Court of Criminal Appeals Judge Charlie Baird, who will be on a panel together with Sam Millsap on Monday March 14 at 7 PM (room at UT-Austin to be announced). Danielle Dirks, who teaches the course “Capital Punishment in America” in the Sociology Department at the University of Texas at Austin. All events are free and open to the public, both studets and non-students. The first two days will be held on the campus of The University of Texas at Austin. The second two days will be held at the Texas Capitol. Rooms to be announced. On Wednesday, March 16, students will participate in a “Day of Innocence” Lobby Day Against the Death Penalty and attend a panel discussion with the six death row exonerees at 3:00 PM in the Texas Capitol (room to be announced). The spring breakers will join other people from across Texas who will come to the Capitol in Austin on the “Day of Innocence” to advocate for reforms that would impact the Texas death penalty, including a package of innocence bills, a bill for a moratorium on executions and a commission to study the death penalty system and a bill to require separate trials in death penalty cases. Students will organize a rally against the death penalty at 5:30 PM at the Texas Capitol on March 16. On Thursday, March 17 at noon, participants in the alternative spring break will attend a screening at the SXSW Film Festival of the new documentary “Incendiary” about the case of Todd Willingham. There will be a Q&A with the Austin filmmakers Steve Sims and Joe Bailey, Jr after the screening. Austin is an appropriate location for this alternative spring break because Texas is the number one execution state in the United States. 466 people have been executed in Texas since 1982, including people who may have been innocent, such as Todd Willingham, Ruben Cantu and Carlos De Luna. Alternative spring breaks are designed to give high school and college students something meaningful to do during their week off. The specific purpose of this alternative spring break is to train the next generation of human rights leaders by bringing students to Austin for five days of anti-death penalty activism, lobbying and education. “We will provide participants with workshops that will teach them skills they can use to go back home and set up new anti-death penalty student organizations or improve ones that may already exist. Participants can apply what they learn to organize against the death penalty or in their activities involving other issues,” said Hooman Hedayati, recently hired as Texas Field Organizer for Witness to Innocence. Hedayati participated in the 2005 Anti-Death Penalty Alternative Spring Break as a high school senior. He later founded Students Against the Death Penalty. Students will gain valuable training and experience in grassroots organizing, lobbying and media relations. There will be opportunities to write press releases, organize a press conference with death row exonerees, speak in public, meet with legislators or their aides, and organize a rally at the capitol. The “Anti-Death Penalty Alternative Spring Break” was started by Texas Moratorium Network in 2004. It is now organized and co-sponsored by Students Against the Death Penalty, TMN, Witness to Innocence, Campaign to End the Death Penalty – Austin chapter, Campus Progress and Amnesty International. This is an historical echo to what happened in 1964 when people came down to the South during the Civil Rights Movement to register people to vote during Freedom Summer. This is similar to what was going on back then, but here the issue is organizing against the death penalty. Many young people from across the nation and throughout Texas have come to Austin over the years to learn about the injustice of the death penalty, train to take action to oppose executions and gain experience lobbying about the death penalty. “Students and youth have played a critical role in every major struggle for civil and human rights in this nation. Ending the abomination of capital punishment is the calling of this generation. Just as before, student activists will likely determine the future of this issue. You must be part of the debate and the action.” – Diann Rust-Tierney, Executive Director of the National Coalition to Abolish the Death Penalty. There is no participation fee for the “Anti-Death Penalty Alternative Spring Break” except for those people who need housing. Housing is $25, which gets participants a place to sleep for four nights in a dormitory or hotel room shared with other students. Participation for students who do not need housing, because they live in Austin or are making their own housing arrangements is free, but everyone is asked to register so the organizers know how many people to expect. Participants are expected to travel to Austin at their own expense and pay for their meals and incidental expenses while in Austin. In their free time, students who are interested in music and film will have time to attend some of the events of the world-renowned SXSW festival.